Every great beach vacation includes an ideal mix of ocean time, fun activities, great food, and relaxation. Fortunately, South Carolina’s barriers islands are perfect for just that! Not sure which one is for you? Read below for a Kiawah Island vs. Isle of Palms comparison to help you decide. If the Isle of Palms is calling your name, be sure to access our free Vacation Guide for dozens of recommendations on things to do on your vacation. Kiawah Island vs. Isle of Palms – Where Should You Vacation? Kiawah Island: Kiawah island features 10 miles of quaint and peaceful shoreline. Most beaches on Kiawah are private, but they can be accessed through the Kiawah Island Resort. The only public beach access, Kiawah Beachwalker Park is located on the west end of the island and features a designated swimming area, picnic area, restrooms, and a boardwalk with a handicap-accessible ramp. Isle of Palms: The beach on the Isle of Palms is a favorite of visitors and locals alike, and for good reason. The wide, white sandy beach leads out to crashing waves where swimming and water sports are abundant. The island lifestyle on the Isle of Palms allows you to be as busy or relaxed as you want. Go parasailing over the ocean, rent jet skis, or simply curl up with a good book. Kiawah Island: Although mostly catering to an older crowd, Kiawah Island can still be a great vacation spot for families. If you’re interested in enjoying some adult activities, you can drop your kids off at Kamp Kiawah for a day full of fun. If you’d rather keep the whole crew together, Charleston and the Isle of Palms is just an hour drive away! Isle of Palms: Family activities are in no shortage on the Isle of Palms. Rent bikes and cruise down palm-tree-lined streets, embark on an eco tour, or head to downtown Charleston and visit the South Carolina Aquarium. If you’re interested in resort-style amenities, consider booking a Wild Dunes vacation rental. The resort community features two oceanfront pools, tennis courts, a fitness center, onsite restaurants, and plenty of activities for the kids. Kiawah Island: No Lowcountry vacation is complete without a delicious Southern meal! Fortunately, South Carolina’s barrier islands are full of fabulous cuisine quintessential to the South. On Kiawah Island, you’ll find upscale restaurants, classic Southern comfort food, and more. Isle of Palms: The Isle of Palms and surrounding area is a food-lover’s paradise. Our Vacation Guide (link above) is packed with suggestions, but here are five of our favorite Isle of Palms eateries. Just a short drive from the Isle of Palms, the neighboring town of Sullivan’s Island is where you’ll find the best dry-rubbed wings, authentic Mexican food, and cozy brunch spots. Kiawah Island: The island’s golf courses are what primarily draw visitors to the area. Kiawah is home to five championship courses at the Kiawah Island Golf Resort. If golfing is essential to your vacation, you’ll find some of the finest golf on Kiawah! Isle of Palms: Considered among the “Best in the State” by Golf Digest, Wild Dunes Resort on the Isle of Palms is a premier golfing destination. As mentioned above, Wild Dunes also features two outdoor pools, water activities, restaurants, and more. If part of your group wants to golf while the others play in the pool or relax, the Isle of Palms is the place for you! Wild Dunes features two of the top Isle of Palms golf courses, but they aren’t the only places you can enjoy a day on the links. Interested in an Isle of Palms Vacation? For a family-friendly vacation with an abundance of activities, the Isle of Palms is an easy pick. Soon, you’ll be relaxing on the beach with your toes in the sand, but first, you need a place to stay! 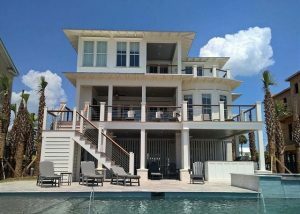 For the best vacation homes on the Isle of Palms, look no further than East Islands Rentals. Our homes are beautiful, spacious, and close to all the top attractions. From oceanfront rentals right on the beach to beautiful homes with private pools, we’ve got you covered for the perfect vacation rental. Book your stay today, and you’ll be enjoying the ocean breeze in no time!